⋯ (December 11, 2008) - All FireWire and USB cameras, manufactured by The Imaging Source - an international manufacturer of industrial cameras - now ship with software for Windows Vista 64 bit. The Imaging Source was one of the pioneers in the field of machine vision to deploy DirectX for industrial image processing. Thus, this step was an easy one to make. Programmers who choose the classical method (illustrated in the right hand part of the diagram) access the hardware directly. This leads to unstable and unmaintainable software, which Microsoft will refuse to certify. Hence, it cannot be installed on Windows Vista 64 bit. Programmers who choose the operating system method (illustrated in the left hand part of the diagram) access DirectX. They do not have to know anything about the underlying hardware. Similarly, the manufacturer of the hardware does not have to think about the applications software. They simply ship a WDM Stream Class driver. This makes their hardware immediately compatible to DirectX. This is a requirement to be certified by Microsoft. Hence, the software can be installed on Windows Vista 64 bit. 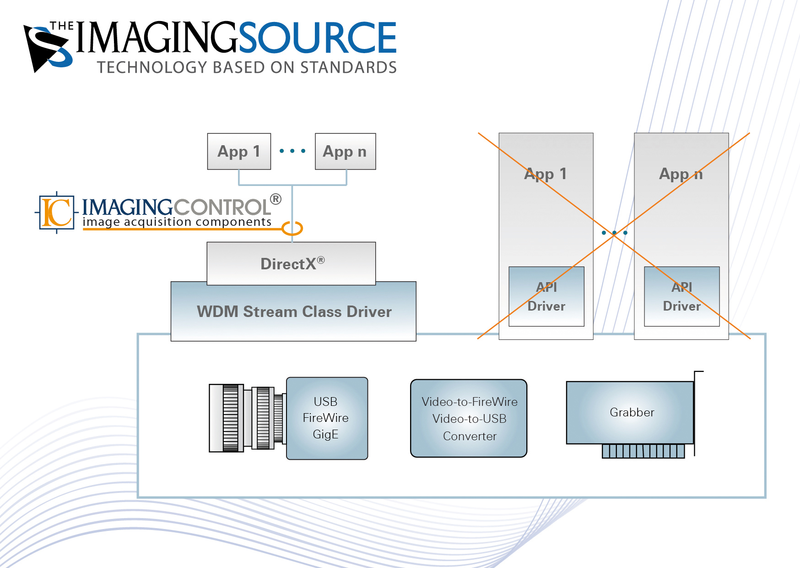 The Imaging Source authors an SDK called IC Imaging Control, the goal of which is to simply development with DirectX. 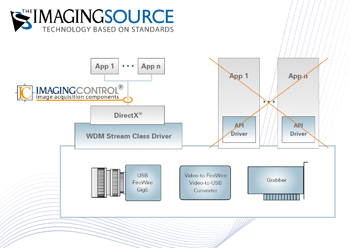 All FireWire and USB cameras, which are manufactured by The Imaging Source ship with WDM Stream Class drivers and IC Imaging Control.